The first image of Maid Marion that pops into my head when I think of Robin Hood’s love is of a regal woman in green. The style of green dress that comes into my mind is like the dress opposite, but without the purple over gown. I think the reason for this is that in the book I had as a child, which told a very romantic version of this tale, Maid Marion wore green. Considering Robin Hood and his band of men all wore green it seemed an appropriate color for her to be dressed in as well. The actual color that the fair Maid Marion preferred or even the style of clothing she wore is anyone’s guess as we’re not even sure exactly when during the Medieval period of history she was alive. We’re also not sure who exactly she was, although there have been a lot of theories espoused. As far as Maid Marion costumes go this is great because it means you really do have a lot of different renaissance gowns to choose from ……. or even no gown! I do remember one tale of a spunky Maid Marion who dressed as a man so a medieval tunic rather like Robin Hoods could be another alternative for a Maid Marion costume idea. This blue Maid Marion costume is quite an appropriate color for her as one of the original tales of Maid Marion seems to have hailed from May Day celebrations where she was seen as a personification of the Virgin Mary. As we all know Mother Mary is often seen wearing blue. The dress also has the appearance of velvet about it and this is interesting because during the Medieval times there were Sumptuary Laws that governed what people could and could not wear. Velvet was one of the materials that could only be worn by those in the upper classes which the stories have often alluded Maid Marion to be. The burgundy which appears to be the color of the costume’s ‘kirtle’ as well as the color of her sash was reserved for the highest nobility as in dukes, marquises and earls. The strands of gold around the neckline was also reserved for the nobility. Although the reviewers haven’t been kind about the quality of the costume I do think the look is perfect for a Maid Marion outfit and it certainly pays a nod to several of the different folklores surrounding this romantic Medieval character. I do remember one of the different tales had Maid Marion dressed up as a man who happened to come across Robin Hood and was challenged by him before they recognized each other. This gorgeous costume features the shirt, cape, pants with boot tops, belt, headpiece and gauntlets. The whole costume looks great, but personally I wouldn’t bother wearing the headpiece as although I think it’s very in keeping with the times if I was dressing up as a man it certainly wouldn’t feature in my outfit! I would also be carrying a bow and arrow, because why should Robin Hood have all the fun! Now if you’ve decided you like the idea of dressing up as Maid Marion in disguise you may be up for making your own outfit. This one will certainly be easier to make than if you want to dress up in a gown! When my daughter was in primary school she came home with the announcement that they had to dress up in Medieval costume the next day (she had forgotten to give me the notes about it! ), it was in the evening so all of the shops were closed. Luckily I had some material which (although not ideal) could be used to fashion a tunic. I then cut a thin wedge out of the middle of the front of the top and added some holes either side which we threaded some garden twine through and laced up (a shoe lace could easily have been used instead). This was worn over a long skirt and long sleeved skivvy by my daughter, but for your DIY Maid Marion out fit I think it needs to be worn over a pair of straight legged trousers or leggings instead of a skirt. The length of the tunic is up to you and I’d probably go just above the knee for Maid Marion dressing as a man – then simply use some rope as a loose belt. 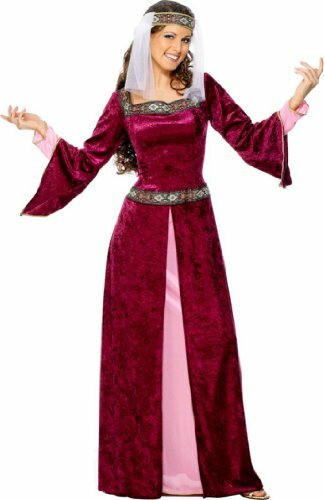 Maid Marion Costume in Burgundy with Dress and HeadpiecI must admit that I’ve seen a lot of Maid Marion costumes that are a burgundy or deep red in color like the one to the side and I think this is because it further promotes the stories of her being from noble birth. One story in particular says that she was of noble blood, but orphaned and was actually a ward of the King. 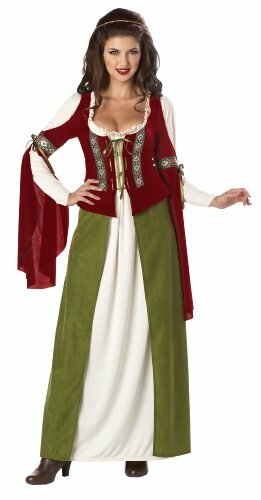 I do like the costume below, however as it combines the burgundy with green and I just do like the idea of Maid Marion wearing green and not just to match Robin Hood either! This really does have everything you want in a medieval dress, the low neckline, the lace up bodice and the sleeves …… the sleeves are probably one of my favorite things about Renaissance fashion! 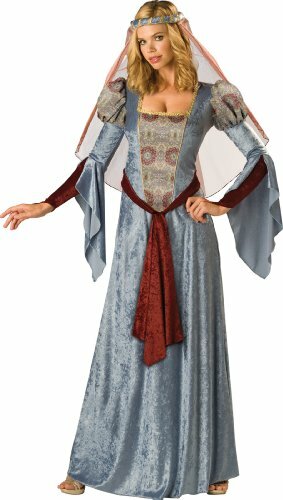 If you would rather make your own Maid Marion costume then there are certainly a lot of sites that will help you, but I think Rosalie’s Medieval Women is a great one to start with. This entry was posted in Costumes, Women's Costumes and tagged maid marion costume ideas, medieval costume ideas, rennaissance costume ideas by Lou. Bookmark the permalink.